Appearance (0-20): There is a gorgeous oily wrapper that greets you on this particular mystery cigar. Its got some significant size with being a 6”x60, but has barely any noticeable veins. No wrapper score on this one since you don’t know exactly what the cigar is. Construction (0-20): There was almost no debris on the cut. Feeling along the cigar revealed that there was no area that was under or over packed. It was absolutely impressive. This was simply reinforced when smoking it as it was a cool, even burn that held its ash very well. Strength (0-20): Some very nice kicks that put you in the medium to full range. Making an assessment, I would say its overall a medium bodied smoke that benefits from the occasional jump into the full range. However, it always veers back to the medium area. Flavor (0-20): Complexity is king. This one begins with a hard pepper kick that held some small flavors of nuts and other spices. Beyond the first inch, the flavor settled into a leathery taste with small hints of pepper, but it was tied with some sweetness that was reminiscent of chocolate. There were additional variances of hazelnut and vanilla that were found from time to time, giving this real solid complexity. Overall (0-100): Since value cannot be taken into effect, the score is representative of the average of the 4 scores. 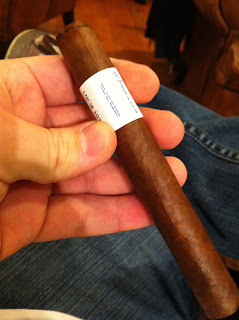 However, if this cigar was priced at a good level (say $7.00 or less) it would catapult this above the 90 mark. There is an amazing level of complexity that plays throughout the entire cigar that would have me buying it every single time. I really wish I knew what this one was! So.... we never actually find out what the cigar was?